In April 1999 during a summit of the Heads of State and Government of the NATO Nations in Washington D.C., an updated Strategic Concept was approved. This committed the Alliance not only to the defence of its members but also to peace and stability in its region and periphery. It thus broadly defined two types of NATO military operations – Article 5 Collective Defence Operations and non-Article 5 Crisis Response Operations (CRO). Peace Support Operations (PSO) are continually developing within the context of CRO. Such operations are designed to tackle the complex emergencies1 and robust challenges posed by collapsed or collapsing states in an uncertain and evolving strategic environment. PSO are conducted impartially, normally in support of an internationally recognised organisation, such as the UN or Organisation for Security and Co-operation in Europe (OSCE). They involve military forces, diplomatic and humanitarian agencies and are designed to achieve a long-term political settlement or other specified condition. They involve a spectrum of activities, which may include Peace Enforcement and Peacekeeping as well as Conflict Prevention, Peacemaking, Peace Building and Humanitarian Relief. 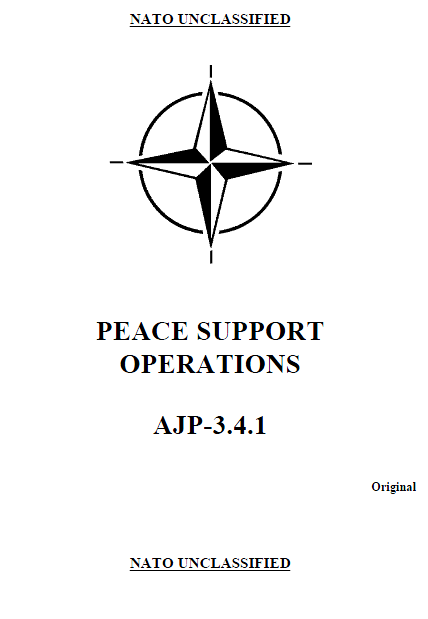 The purpose of this Allied Joint Publication (AJP) is to develop and describe military doctrine for the conduct of PSO. In so doing it aims to guide and inform those involved at both the strategic and operational levels in the conduct of NATO and NATO-led PSO. As such, it should be of use to both NATO and partner Nations. The document is not intended to be overly prescriptive but does incorporate the lessons learned by NATO military forces in the Balkans and by Nations’ forces elsewhere. The response to complex emergencies generally involves both military and civilian elements. Indeed, the military role is normally to create the necessary conditions for other organisations to do their work and so create a stable, self-sustaining secure environment for the longer term. PSO are thus characteristically multifunctional and multi-layered activities. The military doctrine presented here demonstrates this essential partnership and should be read with the wider political and civilian aspects of conflict resolution in mind. The term Peace Support Operations is now widely used by many civilian agencies to describe their activities in complex humanitarian emergencies. PSOs are multi-functional operations, conducted impartially, normally in support of an internationally recognised organisation such as the UN or Organisation for Security and Co-operation in Europe (OSCE), involving military forces and diplomatic and humanitarian agencies. PSO are designed to achieve a long-term political settlement or other specified conditions. They include Peacekeeping and Peace Enforcement as well as conflict prevention, peacemaking, peace building and humanitarian relief. All military operations are conducted with a degree of restraint, be that only an adherence to the Law of Armed Conflict. What distinguishes PSO from other military operations is the impartial approach by the Peace Support Force (PSF). PSO are neither in support of, nor against a particular party, but rather are conducted in an impartial and even-handed manner. PSO are designed to create a secure environment in which civilian agencies can rebuild the infrastructure necessary to create a self-sustaining peace. PSF actions are based upon judgements of the degree of compliance and/or non-compliance of the parties with the agreement between the parties and not against any bias or pre-determined designation. Both the mandate from the appropriate international authority, and the NAC decision should distinguish a PSO from any other enforcement action or war with a designated enemy, by specifying a desired political end state rather than the achievement of military victory. An enforcement operation may attempt to change the correlation of local forces and impose a solution by force alone, and may be required as a precursor to a PSO. The objectives of a PSO will then refer to such issues as the restoration of peace and security, and support for the principles of the UN and International Humanitarian Law. In PSO, the active participation of the parties, in the formulation and achievement of the political end state will be essential. On the other hand, as military operations move towards war or enforcement, the need to engage the parties in dialogue will diminish until ultimately the specified strategic objectives and political end-state could be imposed on the parties without consultation. In PSO, success will generally be related to the achievement of a number of pre-determined strategic objectives which form elements of the overall political end state and should be defined in the overall political mandate and the NAC Initiating Directive. The nature of PSO is such that these objectives will normally relate to the establishment of a secure, stable and self-sustaining environment for the local population. The achievement of the political endstate will be the defining criteria for the success of the entire operation, including the military mission. The achievement of security related military objectives will usually be a precursor, or milestone on the way to attaining the political end-state. The achievement of military goals is relatively easy to state. However, the real or actual success of the operation is related to the daily circumstances of the local populace in the former conflict area and the realisation of a situation in which ‘conflicts are no longer solved using force’. In PSO, overall success may be measured by the achievement of benchmarks (for example increased compliance, demobilisation and retraining of former combatants, and the ability of local authorities to guarantee security). A clearly defined set of criteria and associated operational guidelines enunciated by the senior political authority is thus critical to the success of the operation. The achievement of such milestones and the other strategic objectives related to the political end-state requires perseverance and the efforts of a wide range of civilian organisations and local agencies. The actual success of an operation will therefore be measured against the overall result and not just on the achievement of the military objectives. The achievement of the military objectives and the creation of a secure environment do not guarantee the establishment of a self-sustaining peace. But without security (and justice), the reconciliation, reconstruction and development programmes necessary to create a selfsustaining peace are unlikely to be effective. However, once the security related military objectives have been achieved, the attainment of the political end-state will require the mission’s main effort to be switched from the PSF to the peace building activities of the civilian components of the mission. Without such a switch of main effort and a commensurate switch of funding and resources, the operation is unlikely to progress beyond that of a military stalemate.